Nintendo is once again eschewing a big live press conference at E3 2017 for a variety of other events and activities that honestly sound a lot more fun. For starters, Super Mario Odyssey will be playable on the show floor, so if you're attending E3 this year get ready for some long lines. Nintendo will also be hosting tournaments for ARMS and Splatoon 2. I doubt they'll be as elaborate as the hypothetical tourney in the Switch trailers, but at least we'll see if these games can draw the competitive crowd that Smash Bros regularly pulls. This all sounds fun but if Nintendo wants the Switch to have legs they really need to blow the doors off this E3. They need to reveal some heavy hitters and strong third party support if they want to sustain the Switch's early positive momentum, or else they'll end up with another Wii U on their hands. Nintendo Switch is impressive hardware with a lot of potential but outside of Zelda and Mario Kart there's not much to play on it right now. E3 is the perfect time for Nintendo to prove that's going to change. REDMOND, Wash.--(BUSINESS WIRE)-- As part of Nintendo’s plan to deliver news about upcoming games all throughout the year, the company will provide a packed week of activities at the E3 video game show, which runs from June 13 to June 15 in Los Angeles. Proceedings will be headlined by the first-ever opportunity to play the Super Mario Odyssey game, Mario’s upcoming sandbox-style adventure for the Nintendo Switch system, as well as other Nintendo Switch games. 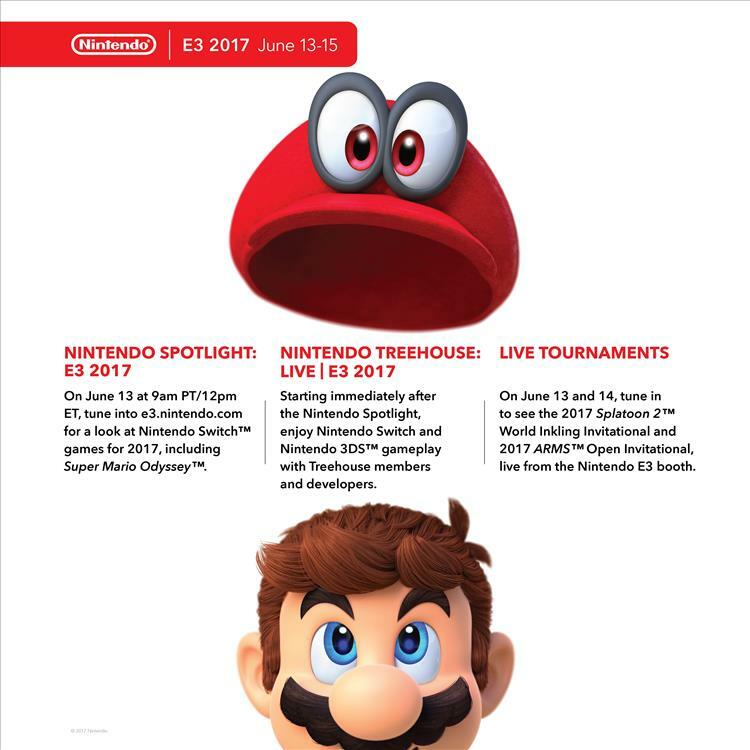 Additional activities at the annual show include a Nintendo Spotlight: E3 2017 video presentation announcing new details for Nintendo Switch games launching this year, the return of Nintendo Treehouse: Live at E3, and tournaments for the ARMS and Splatoon 2 games live-streamed from the show floor. Nintendo’s E3 activities kick off Tuesday, June 13, at 9 a.m. PT with its Nintendo Spotlight: E3 2017 video presentation. Available to view live at http://e3.nintendo.com, this presentation will offer more details about Super Mario Odyssey and other Nintendo Switch games, with a focus on games launching in 2017. Immediately following Nintendo Spotlight: E3 2017, Nintendo is once again bringing back Nintendo Treehouse: Live at E3, a live-streamed showcase of upcoming games for Nintendo Switch and the Nintendo 3DS family of systems. Gameplay for all the featured games will be streamed from the E3 show floor June 13 to June 15 via http://e3.nintendo.com, as well as on Nintendo’s channels on YouTube and Twitch. In addition to gameplay, the livestream will include behind-the-scenes info and commentary from game developers and members of the Nintendo Treehouse. In addition to all of these activities, Nintendo will also host game tournaments that will be live-streamed from the E3 show floor. The 2017 Splatoon 2 World Inkling Invitational splats onto the scene on June 13 and features Splatoon 2 for Nintendo Switch. Composed of four pre-qualified squid squads from the U.S., Japan, Europe and Australia/New Zealand, the tournament will find teams participating in the first-ever international Splatoon 2 competition. The second tournament, the 2017 ARMS Open Invitational, takes place on June 14 and will feature Nintendo’s upcoming ARMS fighting game for Nintendo Switch. About Nintendo: The worldwide pioneer in the creation of interactive entertainment, Nintendo Co., Ltd., of Kyoto, Japan, manufactures and markets hardware and software for its Nintendo Switch™ system and the Nintendo 3DS™ family of portable systems. Since 1983, when it launched the Nintendo Entertainment System™, Nintendo has sold more than 4.4 billion video games and more than 703 million hardware units globally, including Nintendo Switch and the Nintendo 3DS family of systems, as well as the Game Boy™, Game Boy Advance, Nintendo DS™ family of systems, Super NES™, Nintendo 64™, Nintendo GameCube™, Wii™ and Wii U™ systems. It has also created industry icons that have become well-known, household names, such as Mario, Donkey Kong, Metroid, Zelda and Pokémon. A wholly owned subsidiary, Nintendo of America Inc., based in Redmond, Wash., serves as headquarters for Nintendo’s operations in the Americas. For more information about Nintendo, please visit the company’s website at http://www.nintendo.com.